CABLE, Wisc. – New Year’s Day will kick off the Chequamegon Fat Tire Festival’s online registration process for the coming year. The 36th running of the long standing mountain bike event, presented by Trek and produced by Life Time®, the nation’s only Healthy Way of Life brand, will be held over the Sept. 15, 2018 weekend. Registrations will be accepted online starting Jan. 1, 2018 at www.cheqfattire.com. The entry fee will be billed at the time of registration, as long as race spots remain available. 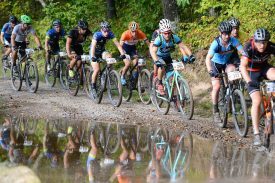 Five dollars of the 2018 entry fee will be donated in various amounts to the Chequamegon Area Mountain Bike Association, the American Birkebeiner Ski Foundation (www.birkie.com) and the International Mountain Bike Association (www.imba.com) to support their local trail advocacy. For complete details of the registration process and other event information visit www.cheqfattire.com. Direct all correspondence to CFTF, PO Box 267, Cable, WI 54821, and 715-798-3594 or via email to cheqfat@lt.life .